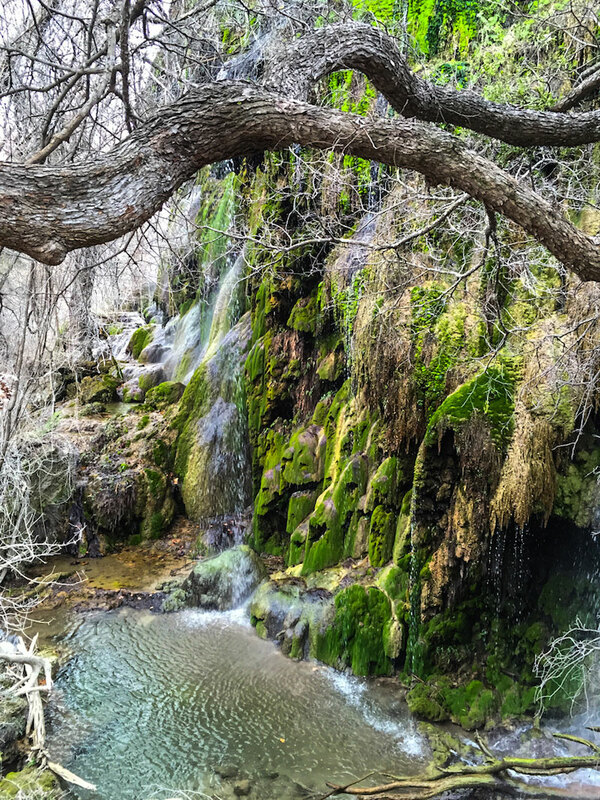 Colorado Bend State Park is tucked away south of the small town of Bend, which has just a post office and a general store. 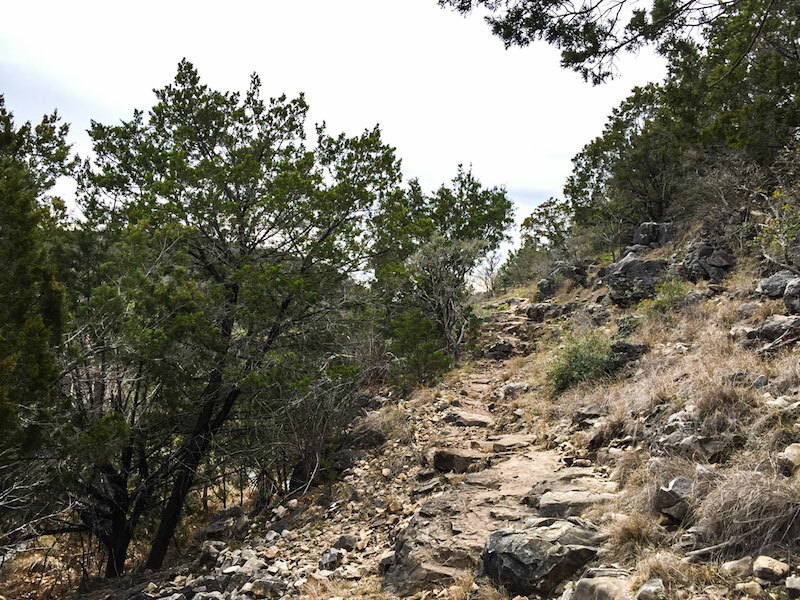 With prickly pear cactus, rocky cliffs and a lush green waterfall, the trails are a definite bucket-list destination for hikers. The trip to Colorado Bend State Park is beautiful. I drove through rolling hills and winding roads, passed farmland with grand ranches and cruised through small historic towns. I saw grazing cows, sheep, goats, horses and even emus! 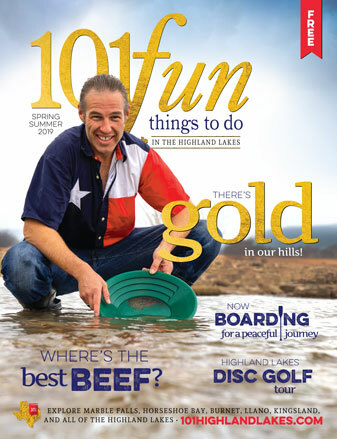 Once you reach the entrance to Colorado Bend State Park, you still have to drive to the end of the road — about 7 miles — to the park headquarters. The headquarters are located along the ever-flowing Colorado River, north of Lake Buchanan. There are several picnic tables in an expanse of green grass at the campground, which sells out every weekend, and also a line of colorful kayaks the park rents out to paddling enthusiasts. An expert tip for visiting any park: Talk to the park rangers. 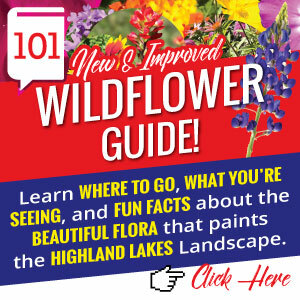 They are enthusiastic to help and want to share their passion for nature. A friendly conversation got me a park map highlighted with the best trails, the most scenic views and a few secret gems. 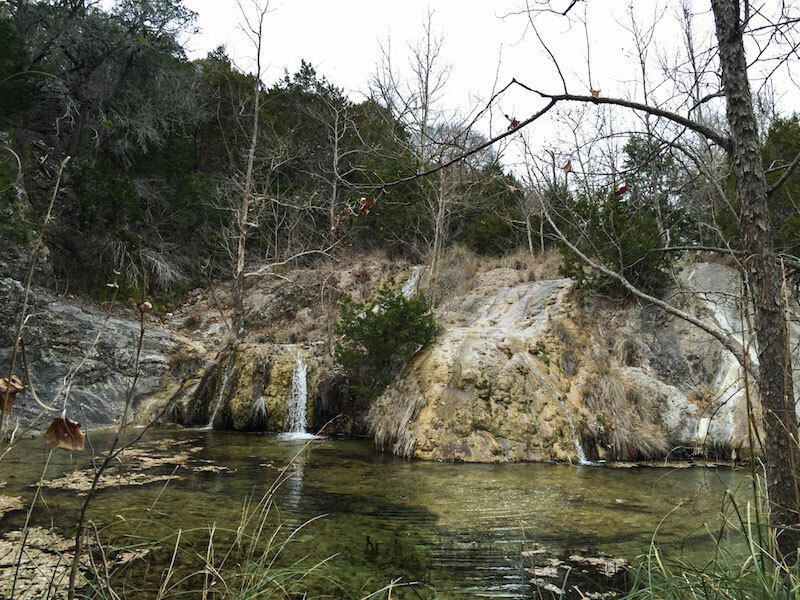 Colorado Bend State Park spans 5,000 acres with 37 miles of hiking trails. The best part about the park is the diversity of it. Each trail is different. One moment you’re exploring the prairie; the next, a desert or a green oasis. I learned that more than 400 caves have been discovered in the park — so far. Guided trails are available through cbcaves.com. If I had known ahead of time, I definitely would have planned a caving adventure. 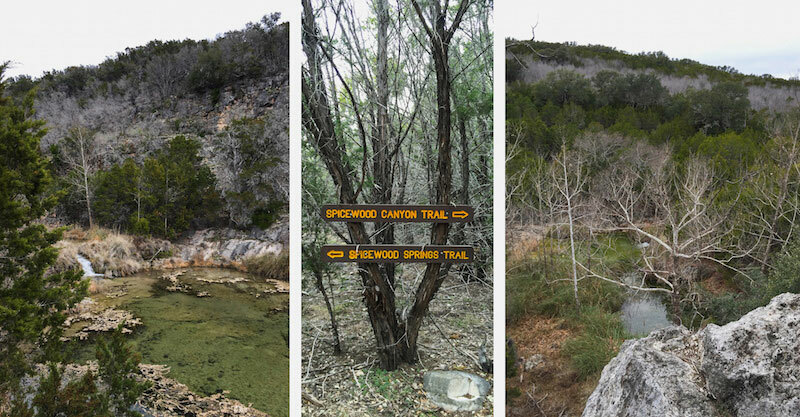 Following my colorfully highlighted trail route, I started off on the Spicewood Trail Loop. The lyrics, “You take the high road, and I’ll take the low road” come to mind in regards to this trail. It's actually two separate trails that connect to form a loop. 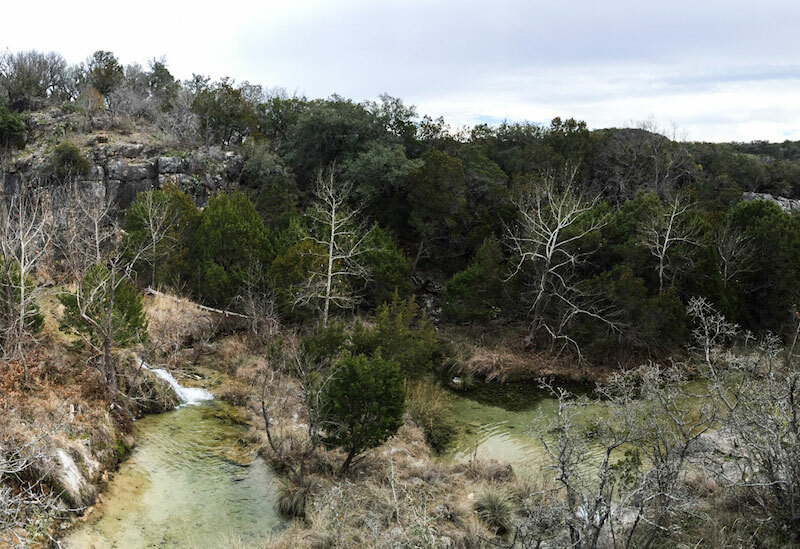 Spicewood Canyon Trail goes high above the springs and meets with Spicewood Springs Trail, which goes down along the creek bed. Spicewood Canyon Trail was difficult. There were several steep inclines littered with loose rocks. But the Hill Country views were incredible. 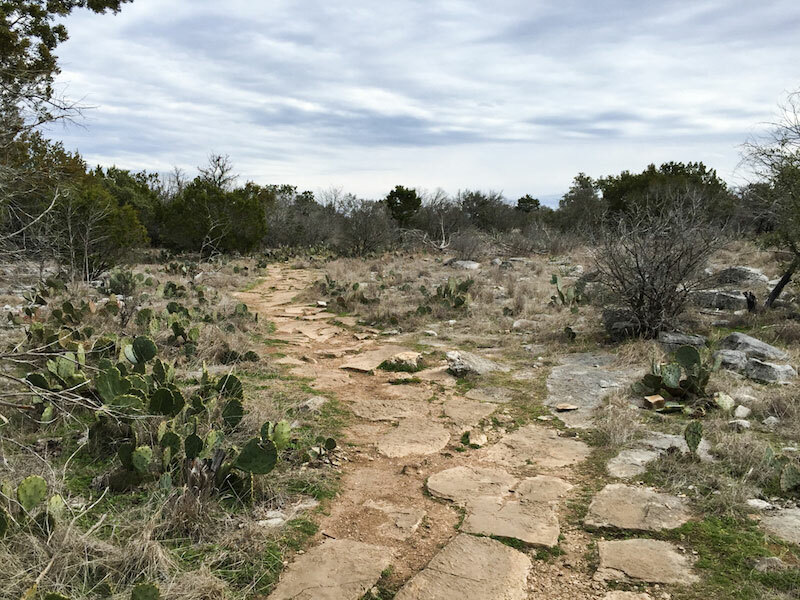 Spicewood Springs Trail is also difficult. The trails are not clearly marked. I was climbing up and sliding down rocks, crossing streams on stepping stones and taking all the wrong turns. My shoes got wet. At times, I thought, “Where am I supposed to go next?” and guessed until I came across the next trail marker. This was more fun and adventurous than it was frustrating. 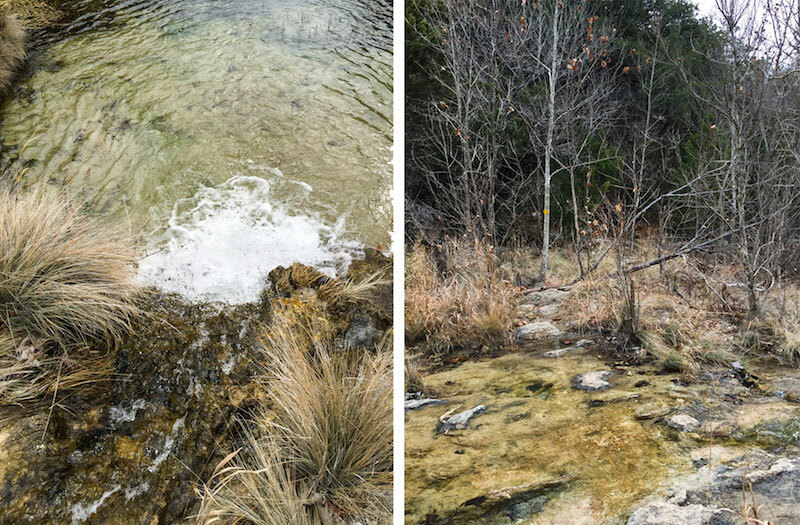 After the Spicewood Loop, a 4-mile hike, I walked back to my car. I could have gone home, but I didn’t want to leave without seeing Gorman Falls. Then, in an expanse of prickly pear cactus and chunky red rocks, I found the sharp decline that led to the waterfall. It looked like something out of a fairytale setting or a picture from a storybook. I could see every color of the rainbow reflecting in the water and on the travertine: deep purples, blues, hot pinks, lime greens. There is a nice wooden patio at the end of the hike where I relaxed for awhile to the sounds of flowing water. It was a little oasis in the middle of Texas, and it was worth the hike. According to my health app, I hiked 9.2 miles and climbed 36 floors’ worth of rocky inclines. I was exhausted. There are still 28 miles of trails left to explore, not to mention all the caves. Of all the parks I’ve been to in Texas, Colorado Bend State Park is my favorite. Colorado Bend State Park is located just south of Bend. For more information, call (325) 628-3240 or visit the website.